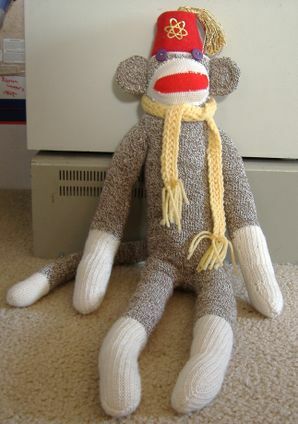 The Sock Monkey (Simia soccum "sock monkey") is a tamable monster who is often taken to bed by small children. It is one of the favored pets of the heroes of Godville. It does not eat, sleep, or argue with the hero about which way to go on the next adventure. It never relieves itself on a ceremonial tree, causing the alien monsters of the region to become angry with the hero and demanding they cut it up into slices and present it in a fancy diagram while apologizing in their native tongue for this total disregard for their culture. No, the sock monkey is content to go wherever it is taken. It does know a few tricks, however. It can sit still, play dead, and may occasionally roll over if there is a strong gust of wind. Some heroes are able to make these pets appear to "talk", but other heroes tend to find this either annoying or creepy unless accompanied by some famous guy named Jeff and his friend, "Almond". This page was last edited on 13 March 2019, at 17:03.